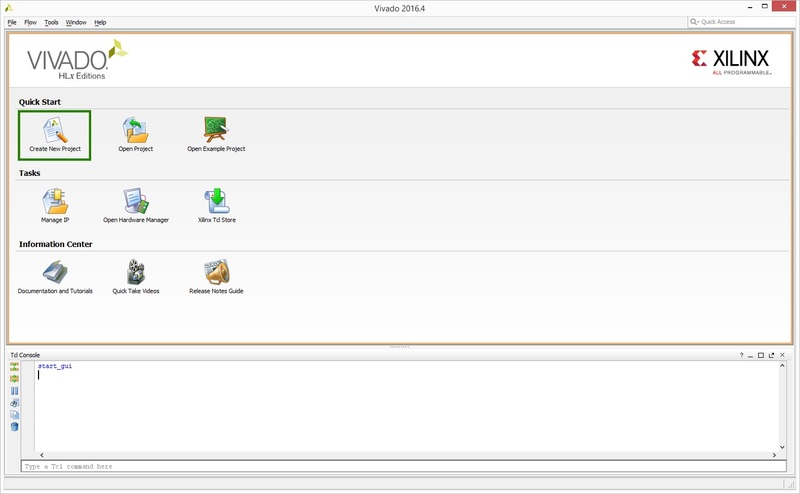 Prior to starting this guide make sure to install Vivado. For more information see our Installing Vivado guide. 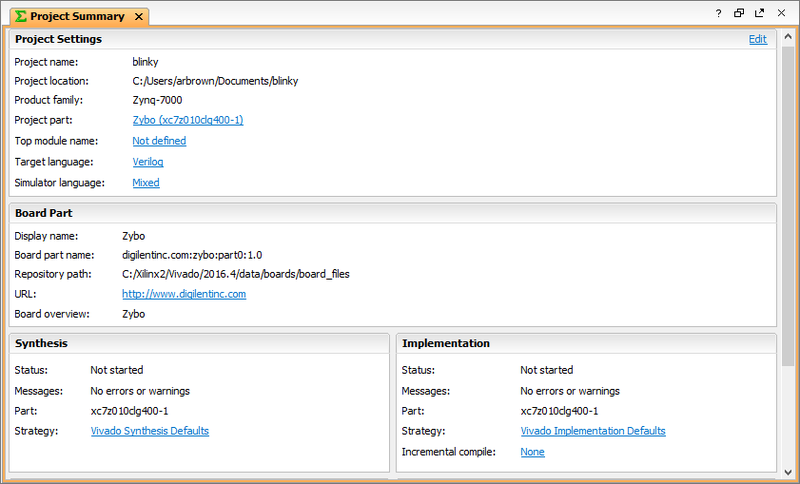 Make sure to install Digilent's board files to make selection of a target board easier. The goal of this guide is to familiarize the reader with the Vivado tools through the hello world of hardware, blinking an LED. 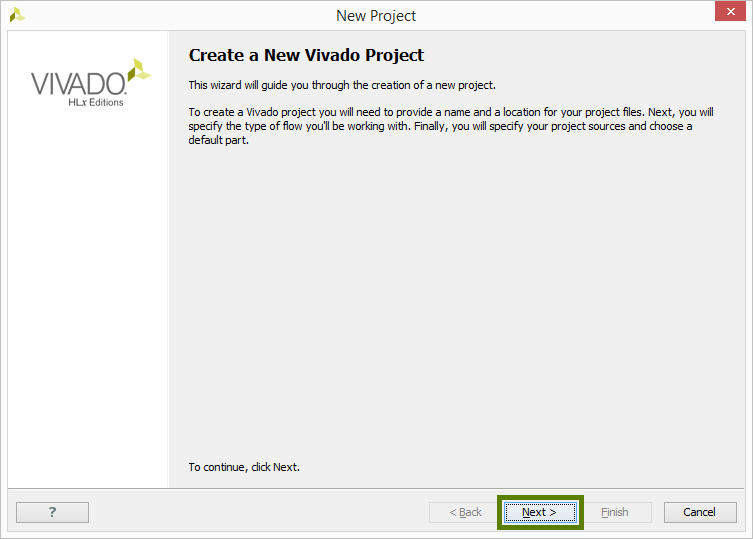 This guide was created using Vivado 2016.4. 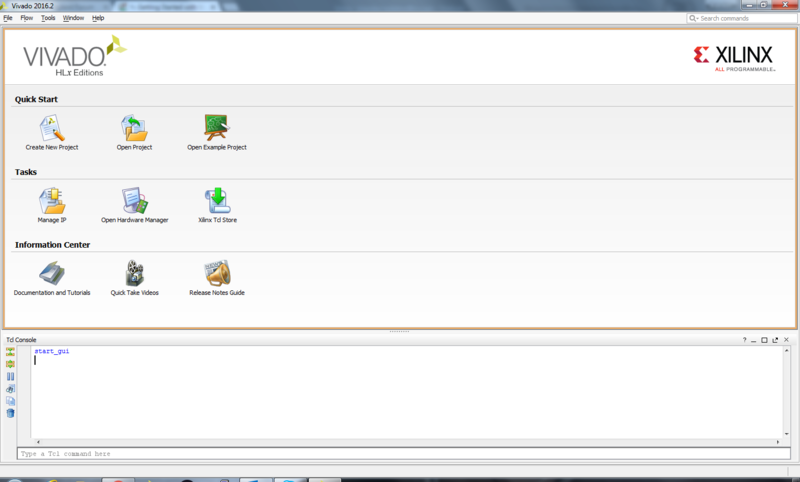 Open the start menu or desktop shortcut created during the installation process. This is the screen that displays after Vivado starts up. The buttons are described below using the image as a guide. This button will open the New Project wizard. This wizard steps the user through creating a new project. The wizard is stepped through in section 3. This button will open a file browser. 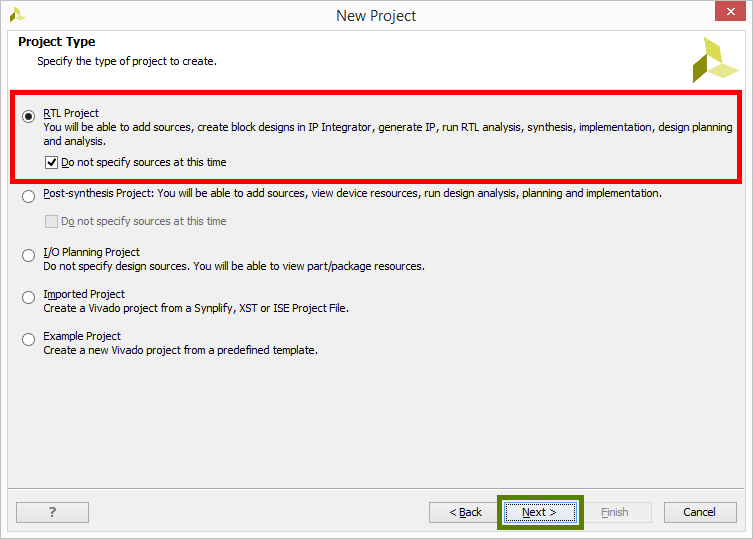 Navigate to the desired Xilinx Project (.xpr) file and click Open to open the project in Vivado. This will guide the user through creating a new project based on an example project. These projects will not work on all devices. This will open the Hardware Manager without an associated project. If connecting to and programming a device is all that is required by the user this is the button to use. 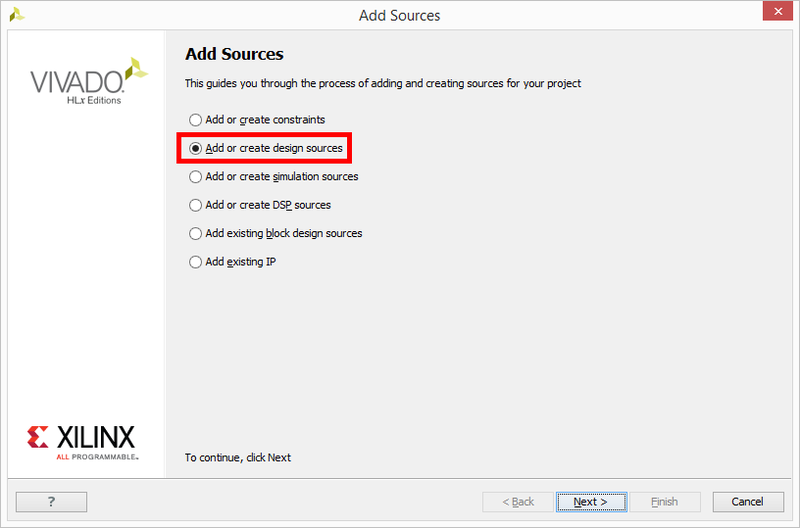 From the start page, select the Create New Project button to start the New Project Wizard. 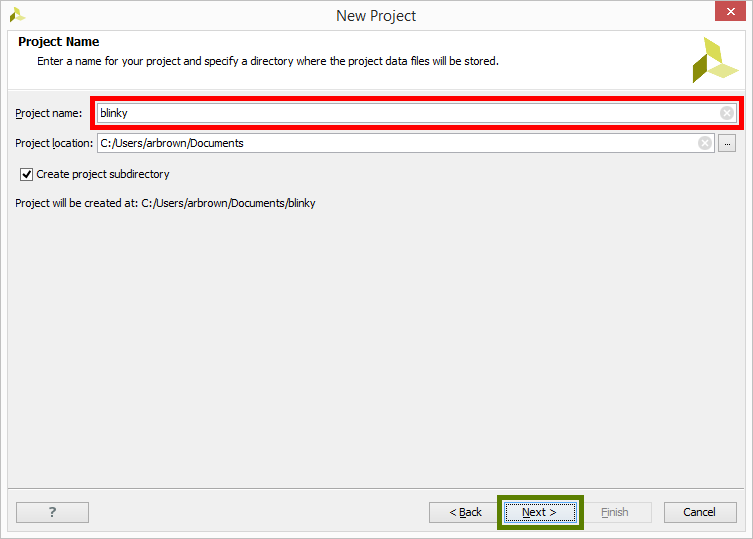 The text in this dialog describes the steps that will be taken to create a project. Click Next to continue to the first step. The first step is to set the name of the project. 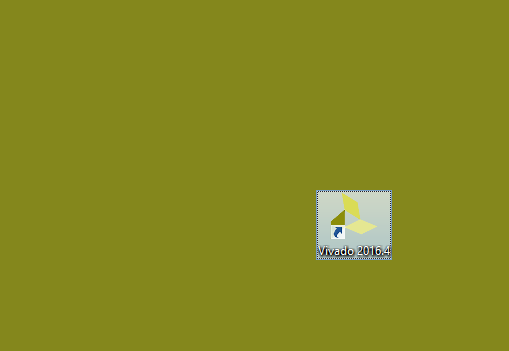 Vivado will use this name when generating its folder structure. Do NOT use spaces in your project name or location path. This will cause problems with Vivado. Instead use an underscore, a dash, or CamelCase. 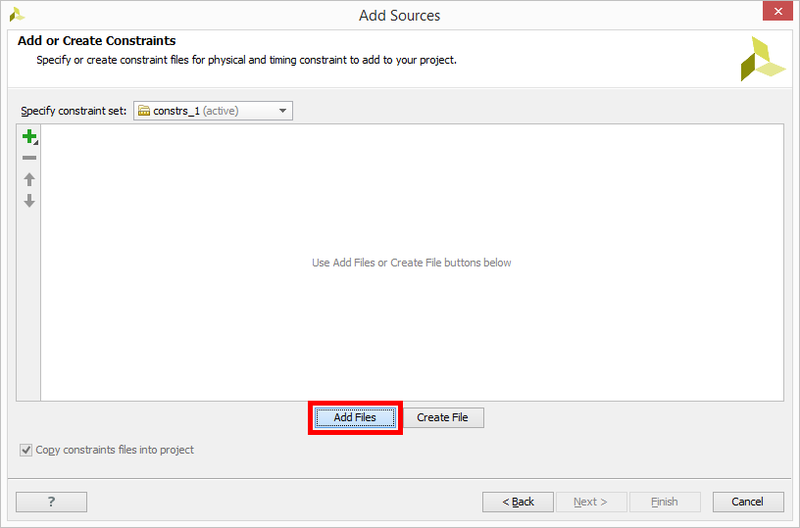 Now that the project has a name and a place to save its files we need to select the type of project we will be creating. Select RTL Project and make sure to check Do not specify sources at this time. 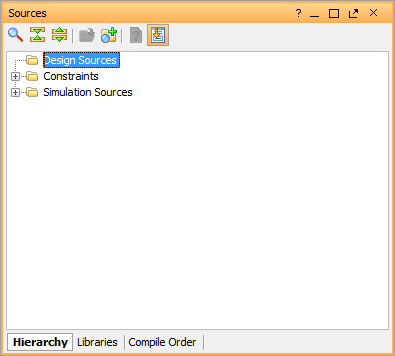 Source files will be added and created after the project has been created. Advanced users may use the other options on this screen, but they will not be covered in this guide. If your board does not appear in this list, then Digilent's board files haven't yet been installed. If this is the case, revisit the prerequisites section of this guide, then close Vivado and start again from the beginning. Now it is time to choose the target device. Click the Boards tab at the top of the dialog, then select your board from the list. The Project Manager consists of four panes, Sources, Properties, Results, and the Workspace. 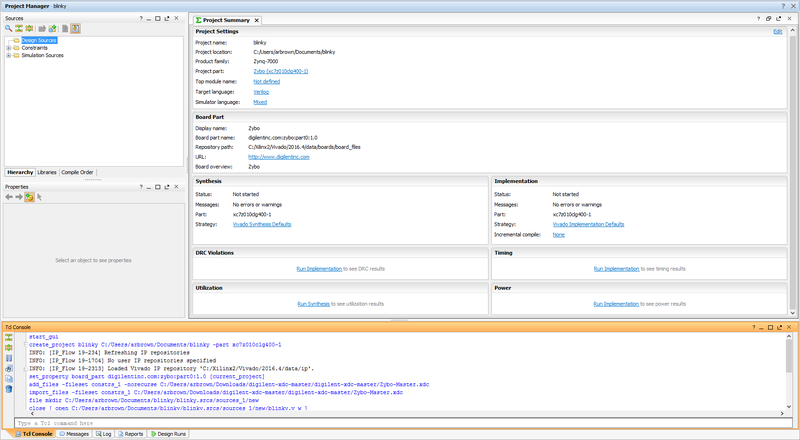 The unnamed pane at the bottom of the Project Manager window consists of several different useful tools for debugging a project. The most important one to know is the Messages tool. This tool parses the Tcl console for errors, warnings, and other important information and displays it in an informative way. 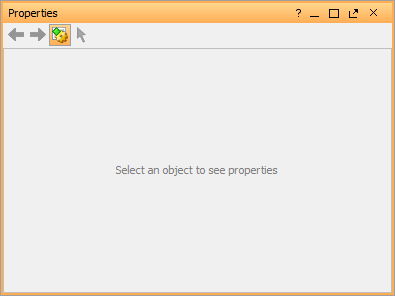 These tools can be accessed by selecting the different tabs at the bottom of this pane. The Tcl Console is a tool that allows for running commands directly without the use of the main user interface. Some messages may link to the Tcl Console to provide more information regarding an error. 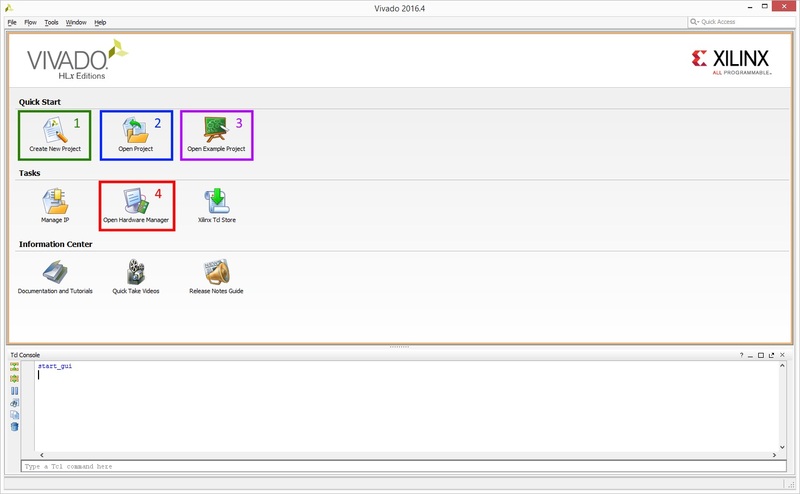 The Reports tool is useful for quickly jumping to any one of the many reports that Vivado generates on a design. These reports include power, timing, and utilization just to name a few. The last tool is the Design Runs. Using this tool run settings can be edited and new runs can be created. This tool is useful when targeting multiple devices with the same design. The most important pane in the Project Manager is the Workspace. 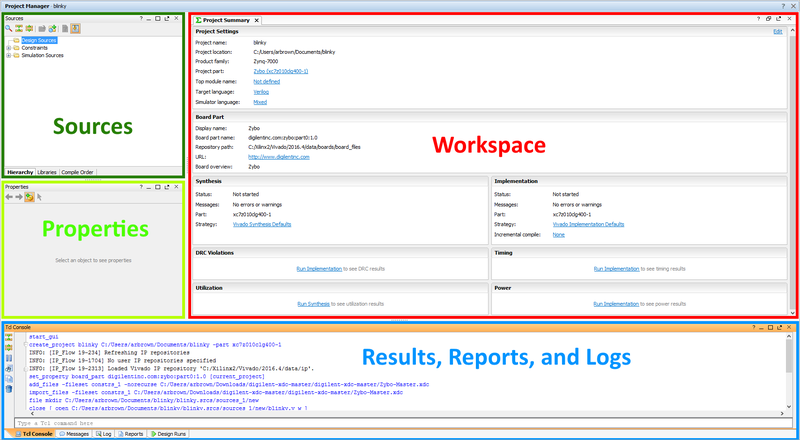 The Workspace is where reports are opened for viewing and HDL/constraints files are opened for editing. Initially the Workspace displays the Project Summary which show some basic information from some of the reports. 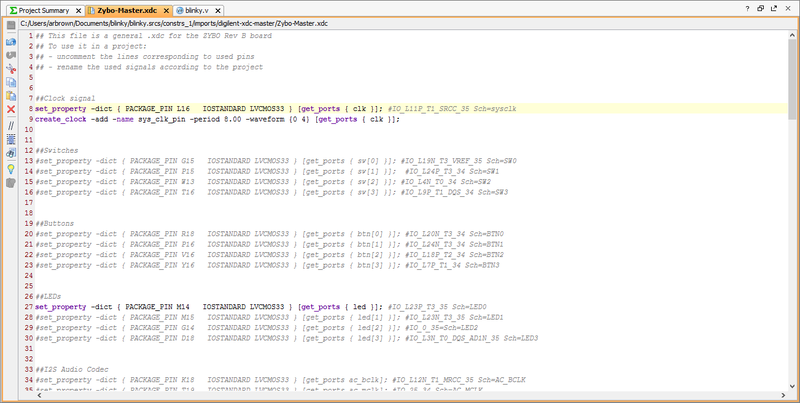 In order to connect HDL code with the physical pins of the FPGA, a constraint file needs to be added or created. Digilent has produced a Xilinx Design Constraint (XDC) file for each of our boards. Download the ZIP Archive containing each of these master XDC files, then extract it in a location you will remember. Find the directory you extracted the digilent-xdc-master.zip archive into, then click on the file for your board. This should add the name of the file to the File Name field. 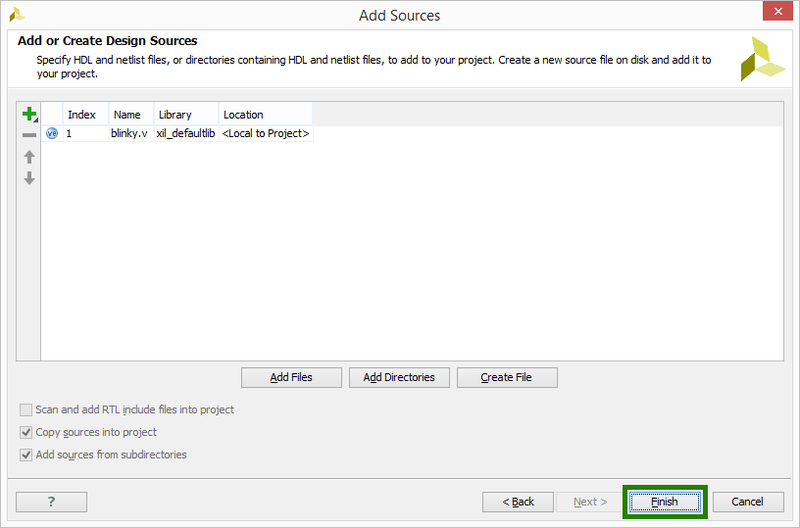 Make sure that the selected XDC file has been added into the list of sources, then click Finish. 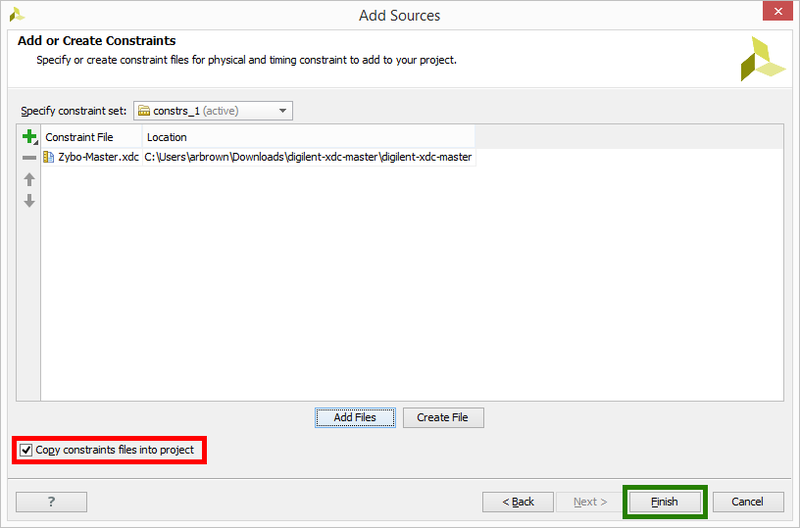 In the Sources pane of the Project Manager, expand the Constraints folder, then double click on the XDC file you just added. Each of Digilent's XDC files contains constraints for each of the commonly used peripherals on their respective boards. For this demo, constraining the default system clock and a single led is required. A board using clk_p/clk_n pins means that the input clock that uses differential logic. If you want to know more read this article on low-voltage differential signalling. As before, at this stage, we will be provided a list of all of the source files that will be added or created when we click Finish. Instead of clicking Add Files, click Create File. 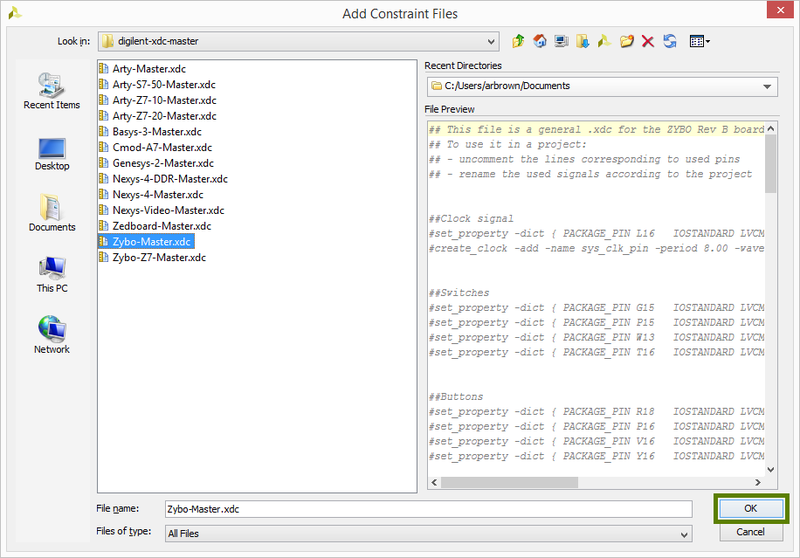 It is also possible to add existing source files in the same way as we added the constraint file above. 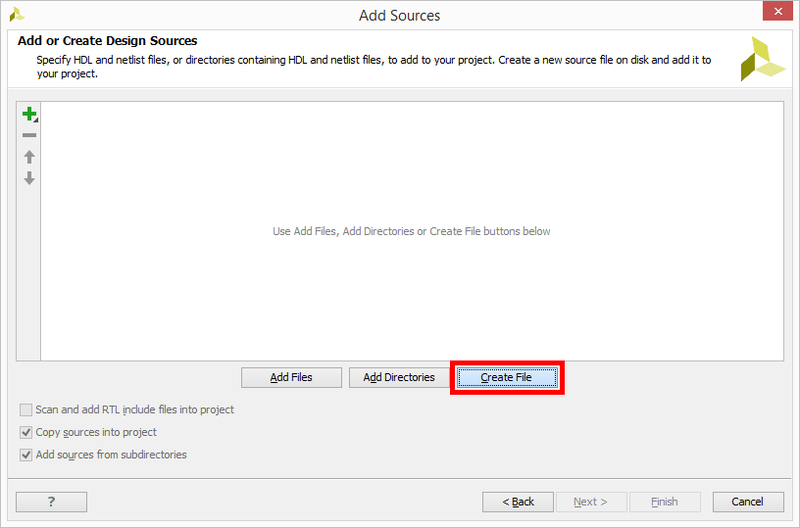 You will be prompted to select a File type, File name, and File location. 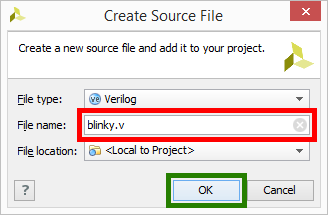 Make sure to pick Verilog and <Local to project> for the type and location. Give your file a name ending in '.v'. Do NOT use spaces in your file name. This will cause problems with Vivado. Instead use an underscore, a dash, or CamelCase. Unlike when the constraint file was added, at this point a Define Module dialog will pop up. You can rename your Verilog module using the Module name field, but this is unnecessary. The Verilog module's clock and led ports need to be defined. 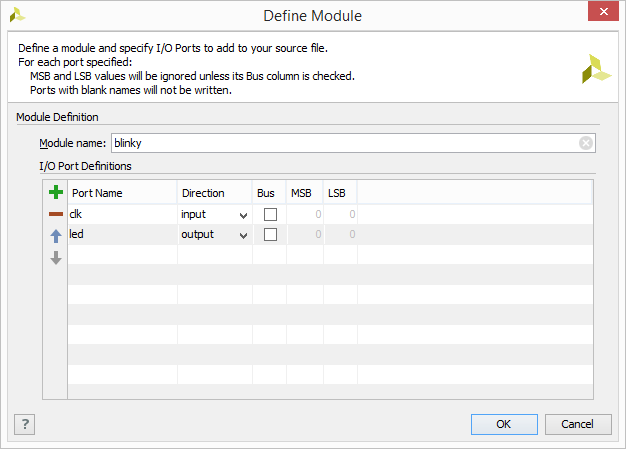 Clicking the Add ( ) button will add an empty slot for a port to the I/O Port Definitions list. 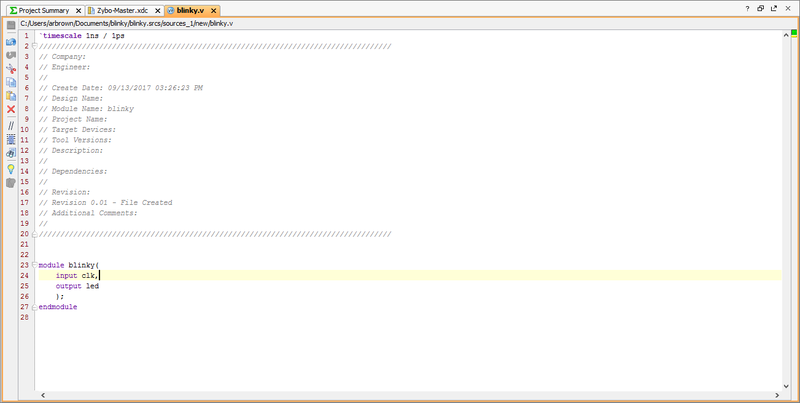 Port Name: This field defines the name of the port and needs to match one of the names you used in your XDC file. Direction: This drop-down menu can be set to input, output, or inout, defining the direction that signals propagate through this port, with respect to your module. Outputs are the signals that your module will be controlling. Bus: This can be checked or not, when checked, this port consists of multiple single bit signals, grouped into a single bus. MSB: The index of the most significant bit of the port, if it is a bus. This option is grayed out for single-bit ports. LSB: The index of the least significant bit of the port, if it is a bus. This option is grayed out for single-bit ports. If you are defining a module which will be instantiated in another module, which we will not go into in this guide, be aware that the port names should not be declared in the XDC, this is only done for your 'top' module. If your board uses differential clocking, add two single-bit input ports with the same names as the positive and negative clock ports that were uncommented in your XDC file. Otherwise, add a single single-bit input port with the same name as the clock port that was uncommented in your XDC file. Add a single-bit output port with the same name as the LED port that was uncommented in your XDC file. After completing this guide, it is suggested to try changing the provided Verilog code so that the clock blinks at 1 Hertz - changing the XDC file beyond commenting or uncommenting entire lines is not recommended. The Bitstream Generator generates the final outputs needed for programming the FPGA. To run Bitstream Generation click either in the toolbar or in the Flow Navigator. With no settings changed, the generator will create a '.bit' file. 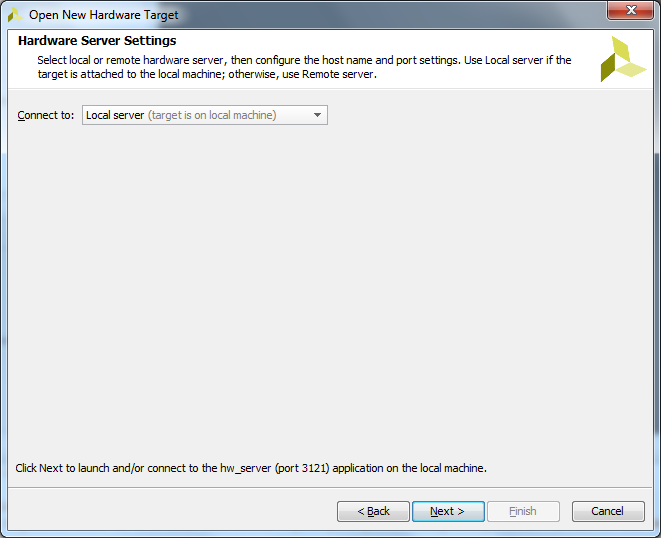 The Hardware Manager is used for programming the target device. 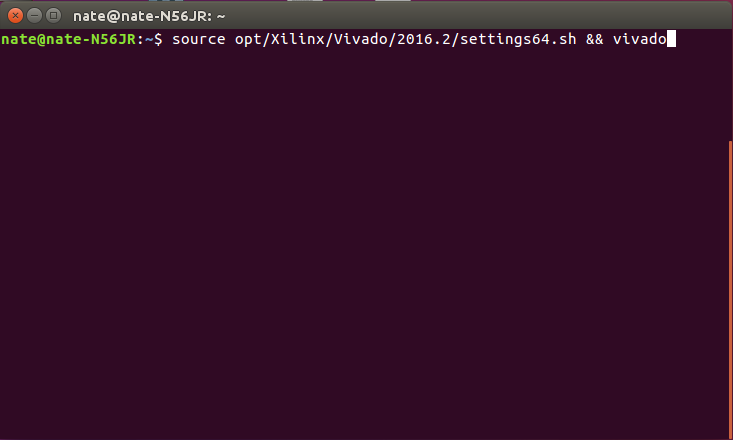 The first step to programming a device is to connect the Vivado Hardware Server to it. There are two ways to do this. The first method is to manually open the target. This is required if the hardware is connected to another computer. 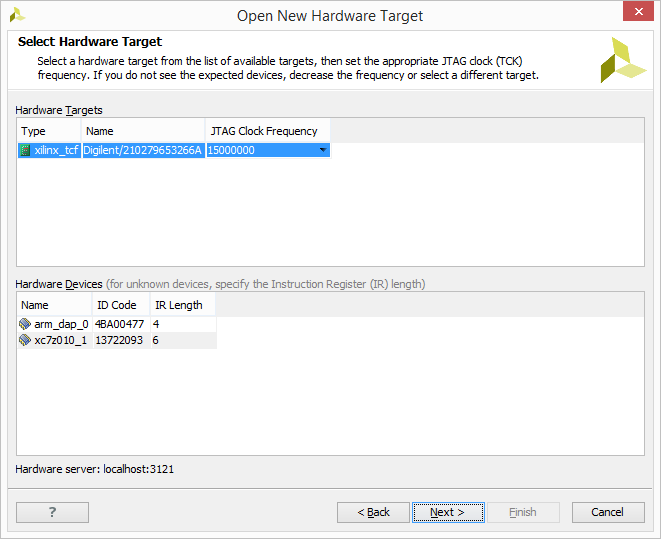 To get to the Open Hardware Target wizard either open the Hardware Manager and click the link in the green banner or click the button in the Flow Navigator under . From the drop-down that opens, select . The second method is to automatically open the target. To get to the button either open the Hardware Manager and click the link in the green banner at the top of the window or click the button in the Flow Navigator under . From the drop-down that opens select . Vivado will attempt to find a hardware server running on the local machine and will connect to the device on the server. You should now see one of the LEDs on your board blinking! Be sure to visit your board's resource center for more tutorials and demo projects. A link to each resource center can be found here.